Board Game Store : EuroGames : Strategy Games : Puzzles : Off The Charts Games: Game Profile: Quarriors! The game of uber strategic hexahedron monster combat mayhem! Quarriors! is a unique blend of strategy and chance featuring a revolutionary dice building game mechanic! It is a fast-paced game of hexahedron monster combat. 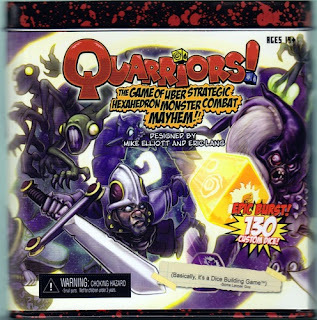 As a Quarrior - a mighty mystical warrior - only you have the power to capture dangerous quarry from the untamed wilds! But your rivals plot against you! They will send their own Creatures and Spells to destroy your Quarry before you can deliver them to Empress Quiana and claim your reward! Summon your Creatures and protect them from your foes and you will earn Glory for yourself. Out maneuver your opponents through strategic spell use, the acquisition of powerful quarry, and ultimately, by striking down opponents' creatures to gain the most glory!